Willamette Riverkeeper's NEW Mussel T-shirt is now for SALE! The Willamette River and its tributaries sustain a wide array of native aquatic species, with some of these at risk. Much of the focus in recent years in the Willamette System has been on native fish such as Spring Chinook, given how such species have been greatly diminished by habitat destruction and dams. One family of species that are not very well known to most people, are freshwater mussels. Native mussels in the Willamette River System include the Western Pearlshell (Margaritifera falcata), Oregon Floater (Anodonta oregonensis) and the Western Ridged Mussel (Gonidea angulata). The most frequently seen mussel in our experience on the Willamette are the Western Pearlshell Mussel. Mussels are a very interesting species. They are filter feeders who remain in the same general area for most of their lives. They filter materials such as bacteria, algae, zooplankton from the water. Western Pearlshell are dependent on native fish to help spread their larvae. When the larvae are released (known as glochidia) they can make their way to the gills and fins of native fish where they can remain for weeks. Then, at just the right time, the larvae drop off the gills, and float down to the river bottom. Once there they burrow down and remain covered for several years as they grow. 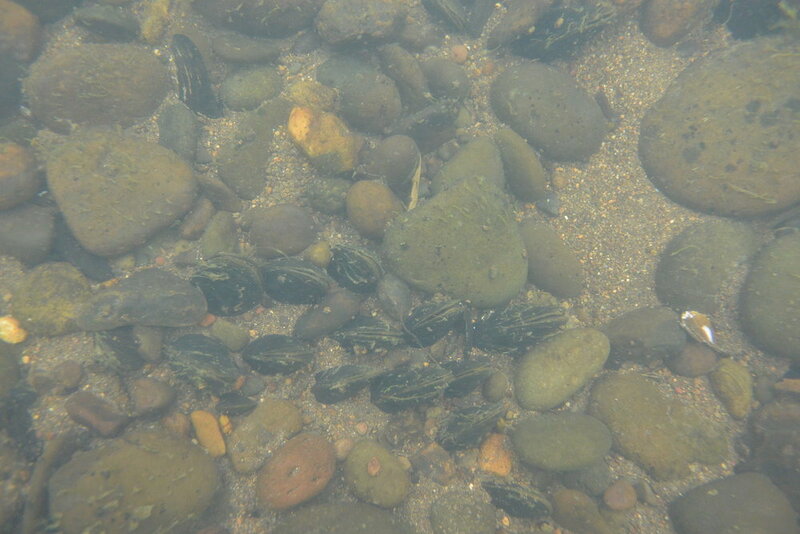 Once they are mature, they can be seen partially buried in the river sediment. Of course, only a small fraction of the larvae ultimately survive to maturity. A unique, dense Western Pearlshell bed. Along the Willamette small beds of Western Pearlshell mussels are typically found, interspersed here and there usually in shallow areas near the shoreline. Sometimes beds can be found in fast moving side channels where there is abundant food. As adults, the dark color of their shells can make them easy to mistake as rocks, with a long oval shell of averaging 5 inches. Empty shells from mussels that have been preyed upon can be seen in clusters here and there. Animal species that typically prey on Western Pearlshell include River Otter, and Raccoon. The biggest threat to this species is the modification of habitat, toxic pollutants, and changing water quality conditions. Given their filtering of the water, they can easily uptake pollutants. In our view, they are deserving of additional study, and efforts to protect their habitat. Over the past few decades freshwater mussel populations have declined steadily, with little consideration for their well-being. In the case of the Western Pearlshell, the species can live to be over 100 years old, and averages about 70. Questions that arise in relation this species today include: 1) Is the population reproducing at a sustainable rate? 2) Are bed sizes decreasing? 3) Are toxic pollutants bioaccumulating in their bodies? A swift moving Willamette side channel, sometimes where Western Pearlshell can be located. In our view Western Pearlshell mussels are easy to appreciate, but they are also at risk. They have a unique role in the Willamette River’s ecology as do Oregon Floaters which are found in slow moving backwaters, and in fewer numbers. Western Ridged Mussels are also occasionally seen. These species can also benefit from increased research to better understand their distribution, overall health and more. Survey at Norwood Island - Over the past 16 years, our staff have taken a keen interest in freshwater mussels. This species is pretty amazing, a native mussel that filters water and can live to be over 100 years old in the right conditions. WR has had concerns about their health in the Willamette River system for years. In 2002 we identified a massive bed of this native species along a side channel at Norwood Island. In the summer of 2017 WR launched a major project to study this population to determine its size, population and whether it was reproducing. Further, we sought to look at a large stretch of river to determine where mussel beds exist. Our work took us snorkeling over 120 miles with staff and volunteers. 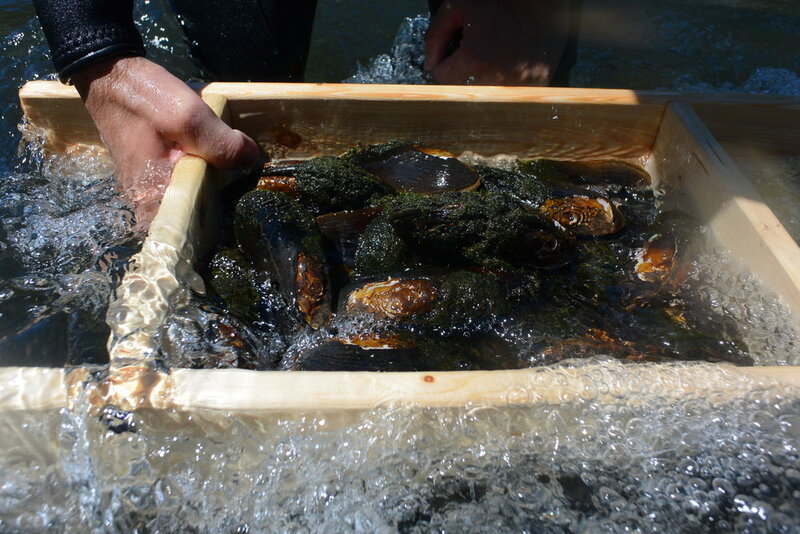 Mussels temporarily removed from river bed to measure during survey. Our team measures and catalogs mussels - Summer 2017. - Pollution, from pesticides to ammonia. - Alteration of habitat and natural river flows. - Lack of presence of host fish during critical times - such as Spring Chinook, Winter Steelhead, and Cutthroat trout. Over the coming months, Willamette Riverkeeper will continue this work, and will study some of the other mussel beds we identified during our snorkel survey this past summer. Quadrat on the river bottom. Mussels within this area are counted. In our view, this work is critical to the health of the overall river system and may indicate necessary steps that must be taken to further improve water quality and reduce toxics in our river. Here a juvenile mussel on the mainstem Willamette (summer of 2017), near Eugene. In the Summer of 2017 WR also conducted a massive survey from south of Eugene to near Salem to determine where mussels are present in the mainstem Willamette River. Data on mussel presence have been historically sparse, and a survey of this type had not yet been done. Over the span of 8 days from August through September, one staff, two board members and two volunteers snorkeled and paddled searching for mussels. Our survey results were interesting. WR identified 10 distinct mussel beds on this stretch of river, and similarities were found between all of them in terms of the type of substrate where mussels tended to be located, as well as flow. We found a range of bed sizes, from hundreds to just a few dozen. Most of the beds seemed to be adult beds where juveniles were hard to identify, yet one of the beds was massive and had multiple juveniles. We will conduct a new study in the Summer of 2018 to determine the population of this bed as well as the rate of reproduction. In the summer of 2018 WR has additional survey work planned. If you would like to take part, let us know!